The current obesity epidemic in the United States has led Americans to search for efficient and healthy, but tasty methods to cook their food. The Philips Company sets out to solve this problem with their AirFryer, which uses RapidAir technology to cook delicious foods using less than 1 tablespoon of oil. So, does the AirFryer succeed in doing this? This review should help you decide this and more. When you look at this AirFryer, it has a rather sleek appearance. The design is black and silver, which will fit into any décor and it appears to be small enough to sit on your counter. While it will sit on your kitchen counter, the Philips AirFryer is somewhat bulky. This contrasts the interior of the appliance, which can only hold enough food for 2-4 people, depending on their appetites. However, this makes it perfect for couples or bachelors. The AirFryer is also designed to be multifunctional. This is made possible by a two-tier chrome rack for frying, a square pan for baking, and a slotted metal grill. These come at an extra cost, but they do allow you to get more use out of the appliance. Some other great features include a digital display for the temperature and timer and handles on the side for easy carrying. 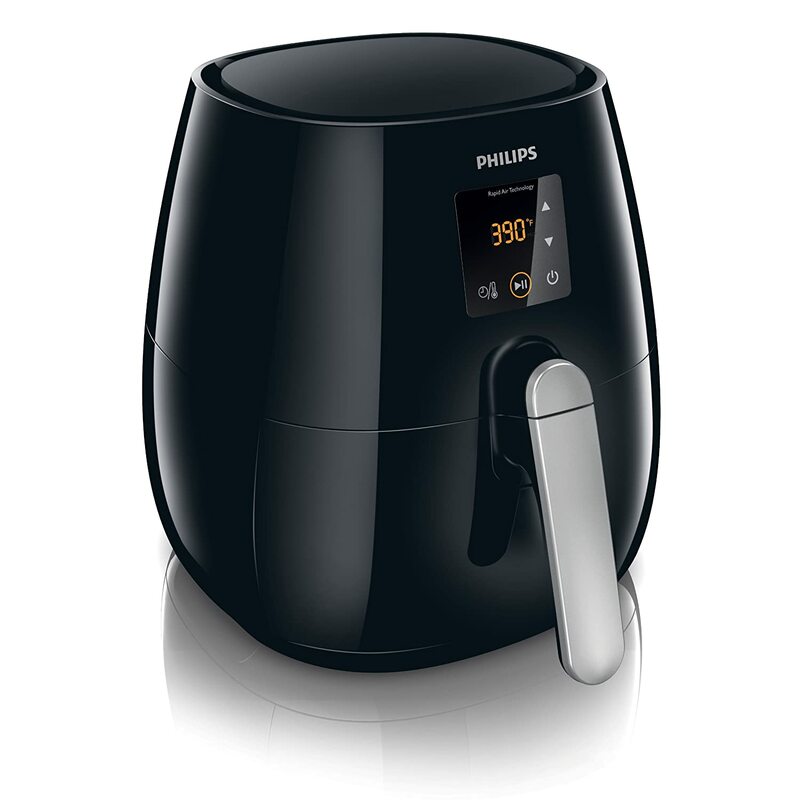 The Philips HD9230 Digital AirFryer takes less time and cooks at a lower temperature than a conventional oven. A book of temperatures, cook times, and recipes is provided, however, this manual does not cover everything you may want to cook in this appliance. You may also be able to find some recipes online, but most of the things you cook will need to be learned through trial and error. Other than this, it is fairly easy to use. You preheat the oven before cooking and it will beep to signify this. Then, you remove the basket and add your food before returning to the AirFryer until it is done cooking. Unfortunately, you may notice smoking and a slight smell if you do not allow the fryer to cool down and clean it between uses. This is true even for batches of food, which can be quite inconvenient if you are trying to cook several batches of food to feed your family. Overall, the food that comes out of the AirFryer is satisfactory. Depending on the level of crunchiness and the texture that you want to get out of your food, you will cook the food for a longer or shorter time. This results in crispy, delicious foods, without the oil and grease that comes from a deep fryer. One thing to note is that some foods may stick to the bottom of the pan, or become dry if you use absolutely no oil. However, a significantly smaller amount is needed to prevent this and foods are still much healthier than when prepared using frying and similar cooking methods. A wide variety of foods can be cooked in this appliance. Sauces will caramelize, pizzas heat and re-heat wonderfully, and breaded or grilled vegetables are amazing and healthy. The AirFryer is rather easy to clean up. It is significantly easier to clean than a deep fryer, but can still become quite greasy if you do not regularly clean it. Additionally, if you choose not to use oil, foods may stick and become charred after time. While the pan is approved for top-rack dishwasher washing, this will not remove the charred foods. Instead, you may find yourself scrubbing to remove it. The total cost of this model is around $, which is twice the price of several other models on the market. However, each of these has its own advantages and drawbacks which should be considered before purchase. Overall, the performance of the Philips AirFryer is satisfactory. It produces healthy, crispy foods without the need for oil. It is easy to clean, and moderately easy to use. While it is not without its downfalls, such as the size of the appliance and the trial and error method that is needed to cook foods, this AirFryer still does the job that it was designed for.